I’m not terribly knowledgeable in photographic techniques, but this appears to be some sort of panoramic shot by noted Dallas photographer Squire Haskins — it looks as if several photos have been joined together. By magic! UPDATE: No magic, afterall. Here’s the same block from a different view. These photos show the south side of the 900 block of Main, between Poydras (on the left) and Lamar (on the right). I love this block. So of course it’s now a parking lot which faces the Bank of America behemoth. Times change. The photos were taken 1952-ish. That top photo is really, really big. Click it and scroll! 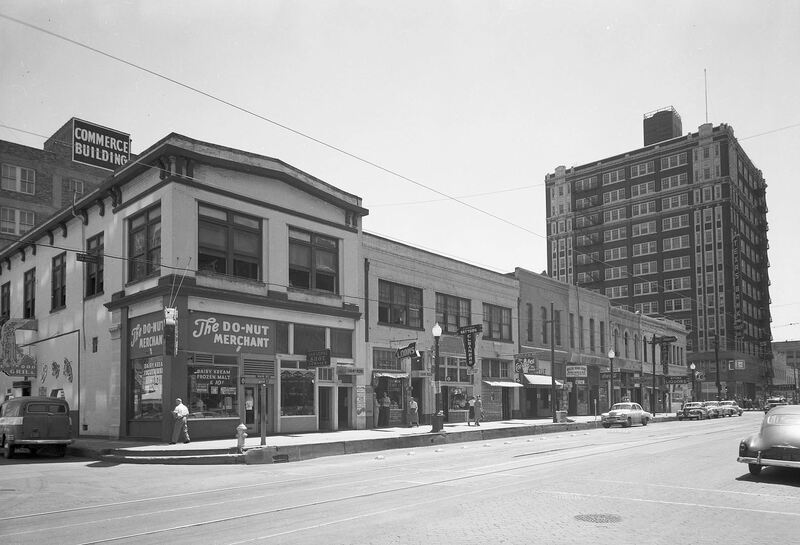 UPDATE: See a photo of the north side of Main, taken by Squire Haskins at the same time as the photos above in the Flashback Dallas post “900 Block of Main, North Side — 1952.” here. Or should I say, several photos. The bottom part of the full photo at UTA makes it obvious it is four photos. But the joins in the cropped version are harder to see. However, you can see the mismatch at the wire in three spots: http://i.imgur.com/2Od9Fgj.png Which means the camera elevation was not kept constant between the different shots. So not magic, but probably an X-ACTO knife some talent and a steady hand. Car is actually the smaller Buick Special. It and the Super are hard to distinguish, but can be identified by the distance from the top of the fender to the driver’s side door handle. In the Special that gap is about 4 to 5 inches, in the Super more like 7 to 8. In the linked pic of the Super this difference can be seen. In the flesh the cars are pretty easy to tell apart, as the Special looks sort of like a Chevrolet in a Buick suit. The car in which I learned to drive was a 51 Buick Super, and first and last I was around that car for 15 years. As a result I felt in my bones the car on Main Street wasn’t a Super but a Special. Then I realized I couldn’t point out any specific feature to seal the deal. Google, of course, will save us eventually, but even so it took a pretty good while to come up with a question that brought a useful response. The answer was the sweep of the fender along the side of the car, something I clearly had never consciously recognized. Loving this site completely. I’ve recently moved to Dallas to an old house in Lakewood. It was built in 1950 and it retains many original features though I suspect there has been an add-on. I am completely in love with it, warts,flaws and all. I want to find out about its history. 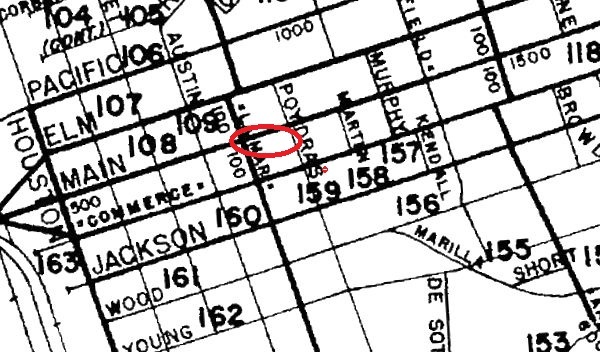 Chain of ownership, original builder and plans, anything of interest or note that may have happened here, just anything and everything at all. I’m not a stranger to this town. I have family here and visited every summer growing up. I’m fascinated by the older parts of town and don’t have much interest in the newer things. Regarding the panorama, I noticed there are no air conditioning units in the windows of the shops or upstairs living quarters. That leads me to the question, “When did a/c become common here?” I remember the “swamp coolers” in the windows of relatives we visited, (which always seemed to need some sort of fixing), but that was the 60’s. I just cannot imagine living through the summer here without a/c!!! Correction: on closer inspection, I did notice a window unit in the upstairs above car on the left. So, a/c was obviously around then, but was it common? That’s an interesting question — I don’t really know the answer! I would have thought that by this time A/C window units would have been fairly common, at least in homes, but I’m not sure about downtown businesses. (These were all businesses — I don’t think anyone was living upstairs in this block.) It’s hard to believe anyone managed to survive summers here in the era before air-conditioning!